LOWE’s Company (LOW) is a home improvement retailer. It focuses on retail do-it-yourself (DIY) customers and do-it-for-me (DIFM) customers who utilize LOW’s installation services, and commercial business customers. Its product lines include products and services for home decorating, maintenance, repair, remodeling, and the maintenance of commercial buildings. It has approximately 1650 retail stores in US and Canada. LOW is member of Dividend Aristocrats, Mergent’s Broad Dividend Achiever Index, and S&P500 Index. 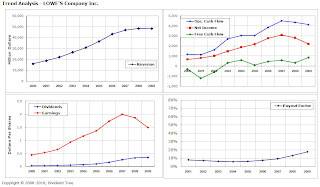 The most recent dividend increase was in July 2010.
Dividend cash flow vs. income from MMA: Here, I analyze how the dividend cash flow stacks up against the income from FDIC insured money market account. The baseline assumption is (a) stock is yielding 2.0%; and (b) MMA yield is 1.75%. 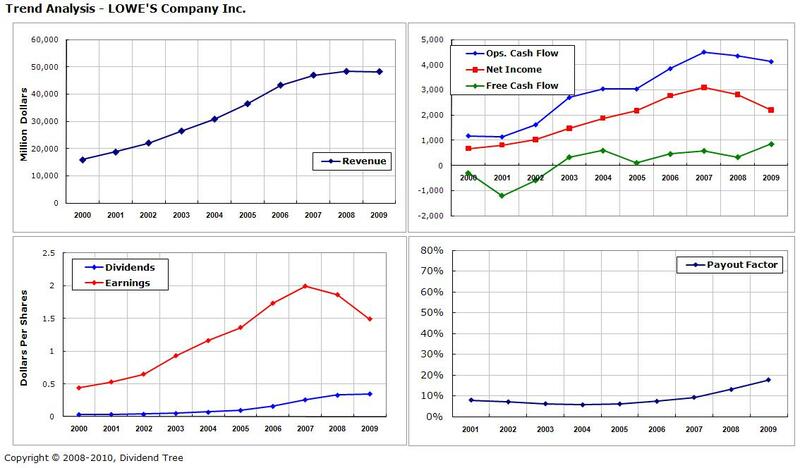 With my projected dividend growth of 8.2%, the dividend cash flow is 2 times the MMA income in 10 years time period. Lowe’s Corporation is a stable and slow growing company in long term. It is expected to continue to have a sustainable cash flow over next few years. One issue with Lowe’s is that, historically, it has had a very low dividend yield of less than 2%. At such a low yield, it is less attractive relative to any high yield bond or CDs. However, LOW shares bought at fair value or below would make up of the lack of dividends. In addition, the low payout factor and low dividend risk provides stability for dividend cash flow. The current pricing of $22.19 is less than my buy range. I would continue to add to my existing position based my allocation levels.